From proper haircare and gentle cleansing routines, to changing your pillow case regularly. Most of us will suffer from acne at some point in our lives. The forehead—as part of the oil-prone T-zone—is especially vulnerable. 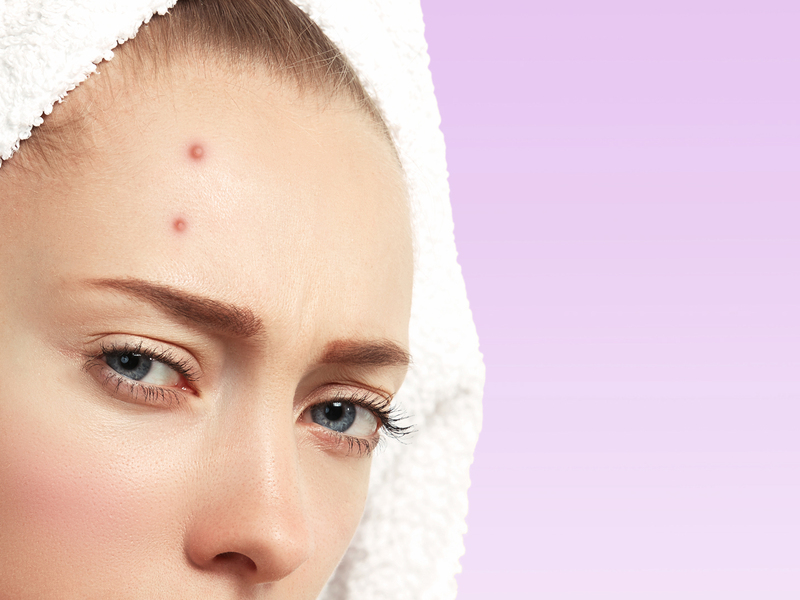 In this article, we’ll discuss the causes of forehead acne, the best spot treatments for forehead acne, and natural acne prevention measures. Acne starts with your sebaceous glands, which are responsible for the production of your skin’s natural oil (sebum). When these glands go into overdrive and begin to produce too much oil, that excess oil causes oily skin and acne. There are many factors that can cause our sebaceous glands to produce too much oil, including unavoidable genetic factors. However, hormone imbalance and stress can also contribute to oil overproduction. If you suspect that your acne has a hormonal cause, we recommend taking measures to balance your hormones after consulting your doctor. These can include changing up your diet and exercising. If you’re experiencing high levels of stress, we recommend that you seek medical advice, as well as learning about stress management techniques. In this article, we’ll discuss all the best tips and tricks for combatting forehead acne—from DIY spot treatments to natural products you can purchase online. It’s important to be gentle with any existing spots you may have. Instead of squeezing them or touching them directly with your fingers, try applying warm compresses to open up the pores. These compresses will help to draw oil out of your skin, and to prep your pores to receive spot treatments. You can also follow up with a cold ice pack to reduce inflammation and redness. Tea tree oil: Research has shown that tea tree oil can be effective when it comes to fighting acne. To use it as a spot treatment, make sure to combine it with a carrier oil that won’t clog pores, like aloe vera gel or jojoba oil. Applying tea tree oil directly to the face can cause your skin to dry out, causing your sebaceous glands to produce too much oil, thereby worsening your acne. Try starting with a ratio of 1-2 drops of tea tree oil per 1 tablespoon of carrier oil. Lavender oil: What research we do have on lavender oil stands to support the health claims that have historically surrounded it: namely, that lavender oil has antimicrobial and anti-inflammatory properties. As with tea tree oil, it’s important to dilute lavender oil before applying it to your skin. We recommend using aloe vera gel or jojoba oil as a carrier oil, mixing 1-2 drops of lavender oil into each tablespoon of carrier oil. Lemon juice: Lemon juice naturally contains citric acid, which has astringent properties to help push excess oil out of your skin. We recommend diluting lemon juice a bit to avoid irritating your skin. Try mixing ½ tablespoon of lemon juice with ½ tablespoon of honey. Aloe vera: Research on aloe vera gel has demonstrated that this substance has healing properties, anti-inflammatory properties, and antiseptic properties. This means that aloe vera gel will go further than fighting acne-causing bacteria. It will also help to reduce the redness associated with acne, and heal existing spots to prevent scarring. You can dab organic aloe vera gel directly onto an acne spot, or combine it with the essential oil of your choice. Green tea: Green tea contains polyphenols, which have been scientifically shown to help reduce the amount of sebum your skin produces. So drinking about 2 cups of green tea per day could help to reduce your acne by balancing out your skin’s oil production. Green tea is also great for topical use due to its high antioxidant content that helps to heal damage and promote skin health. It also has astringent and anti-inflammatory properties to balance out acne. This spot treatment features salicylic acid, glycolic acid, and white willow bark to deep-clean affected areas of your skin, while reducing inflammation and calming redness. It’s intended for oily and combination skin, making it perfect for chronic acne sufferers. To use it, cleanse your skin and then dab a thin layer onto any affected areas. You can use this product up to three times per day, but we recommend starting with one usage per day to see how your skin will react. While many spot treatments tend to dry out the skin, this formula uses a combination of gentle essential oils to combat acne bacteria while preventing dryness. Lavender oil, parsley seed, and rosemary extract diminish acne-causing bacteria, while evening primrose oil nurtures and heals the surface of your skin, preventing irritation and scarring. You can apply this product to blemishes up to five times a day. But you should make sure to apply it only to affected areas, and not to your entire face. This product delivers key minerals such as magnesium and zinc to your skin, promoting healing and overall health. Meanwhile, it combats acne with antimicrobial essential oils such as sea buckthorn oil, and eases inflammation with arnica and olive oil. This multi-dynamic product will help to clear up your skin in the short term, while delivering vital nutrients to prevent future breakouts. It can be applied to problem areas as needed throughout the day. While there are plenty of natural solutions for clearing up existing acne spots, there are also ways to prevent the formation of new pimples. When it comes to meaningful, long term skin care, it’s important to take a holistic approach. Because the truth is that taking care of your skin involves more than dabbing products onto it. In order to fight blemishes in the long-term, try taking a multi-pronged approach that includes eating a healthy diet and getting enough exercise. You should also makes sure to avoid common, everyday behaviors that can lead to acne (which we’ll discuss below). This shampoo was formulated to take care of the scalp, fighting psoriasis and dandruff with gentle ingredients like aloe leaf juice and and rosemary leaf. 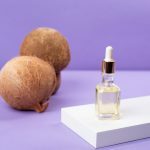 By using these healthy ingredients on your hair and scalp, you’ll prevent oil overproduction along your hairline, which can lead to forehead acne. And you’ll know that your shampoo is nurturing your skin, not irritating it. This shampoo was designed to balance your scalp’s pH and fight excess oil, which can help to alleviate acne along your hairline. It’s great for sensitive and dry scalps, and contains natural ingredients like argan oil, aloe vera, and chamomile. The hair styling products that you use can also have an impact on your skin’s heath. 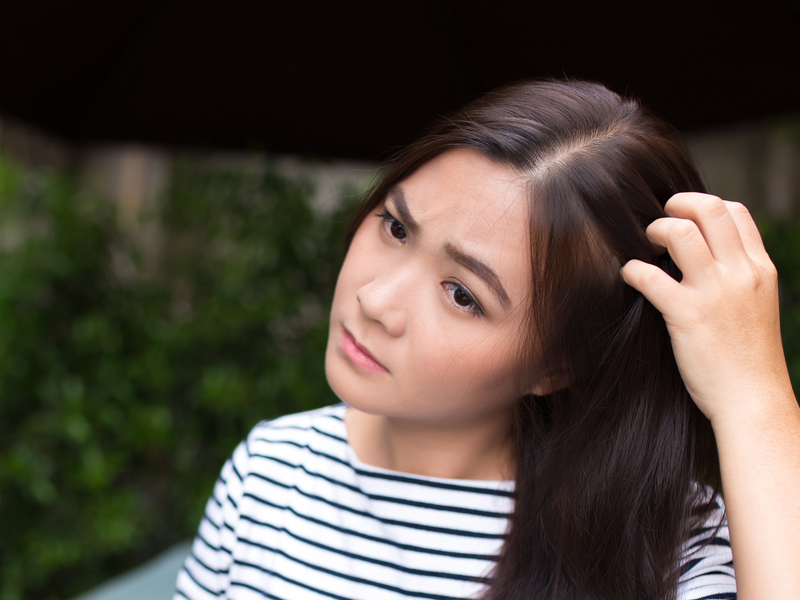 Like harsh, chemical-based shampoos, many hair styling products can cause pH imbalance and excess oil production along your hairline, leading to pimples. As you use these products in close proximity to your forehead, trace amounts can also come into contact with your skin, irritating it and causing acne. This handy gel enhances your hair’s natural shine with sunflower oil, while using a synthesis of healthy, plant extracts to condition your hair and scalp. It’ll help you to achieve the perfect, all-day hairdo, while supporting hair and scalp health. Traditional, aerosol hairsprays are a nightmare for your respiratory health and skin health, as well as for the environment. Luckily, John Masters Organics has created this clever spray bottle full of USDA-certified organic goodness. It’s free of synthetic polymers and plasticizing agents, relying instead on hair and scalp-healthy ingredients such as aloe leaf juice to set your hair into your desired style. While it’s important to not over-wash your face (thereby stripping it entirely of its natural oil and stimulating overproduction) we recommend washing once or twice per day with a gentle cleanser. Check out our guide to the Best Face Washes for Oily Skin to discover our favorite products, and other tips and tricks. Using dirty makeup brushes, touching your face with unwashed hands, and going too long without changing your pillowcases can all worsen your acne. It’s important to change up these behaviors and focus on good personal hygiene. Make sure that you’re cleaning your makeup brushes frequently enough to prevent bacteria from accumulating on your brushes. You should also change up your makeup products every couple of months to avoid contamination. You should also fight the urge to touch your forehead throughout the day. We know that this can be difficult, especially when you’re worried about acne spots on your forehead. However, the bacteria on your fingers can make forehead acne much worse. On a similar note, you should avoid popping pimples at all costs, as this can spread bacteria to other areas of your skin, and increase your risk of getting a skin infection. Your pillowcase may not look or smell dirty after a week’s use, but it probably still needs to be washed. Over the course of the week, pillowcases come into contact with sebum from your skin and hair, as well as dead skin cells. When you sleep on the same pillowcase again and again without washing it, you’re effectively pressing your skin up against this old oil and dead matter. Forehead acne can be stubborn and frustrating to deal with. But luckily there are plenty of ways to combat it. And while you’re working on clearing up your skin, you can always rely on makeup to help cover up any embarrassing spots. Check out our guide to the Best Natural Foundations for Every Skin Type to find a foundation that will work for—not against—your skin. How to Choose the Best Shampoo for Oily Scalp: Fight that greasy mess and restore your locks to silky softness with these purifying formulas.